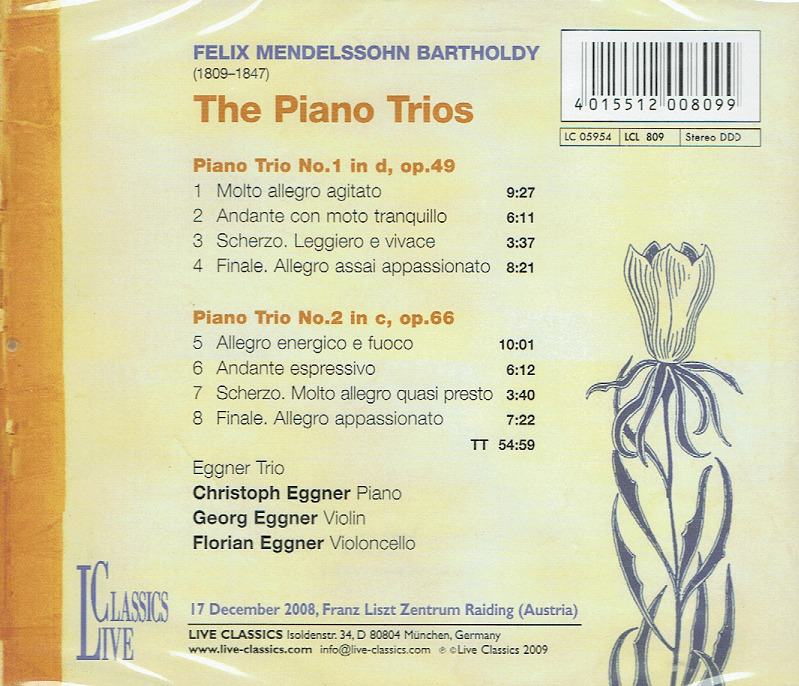 “The Eggner Trio is a piano trio from Vienna. The members are three brothers: Georg Eggner (violin), Florian Eggner (cello), and Christoph Eggner (piano). 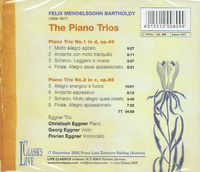 The trio performs and records a range of classical and modern chamber works. It has appeared in such distinguished venues as Wigmore Hall in London and the Concertgebouw in Amsterdam, and in 2003 won the Melbourne International Chamber Music Competition. 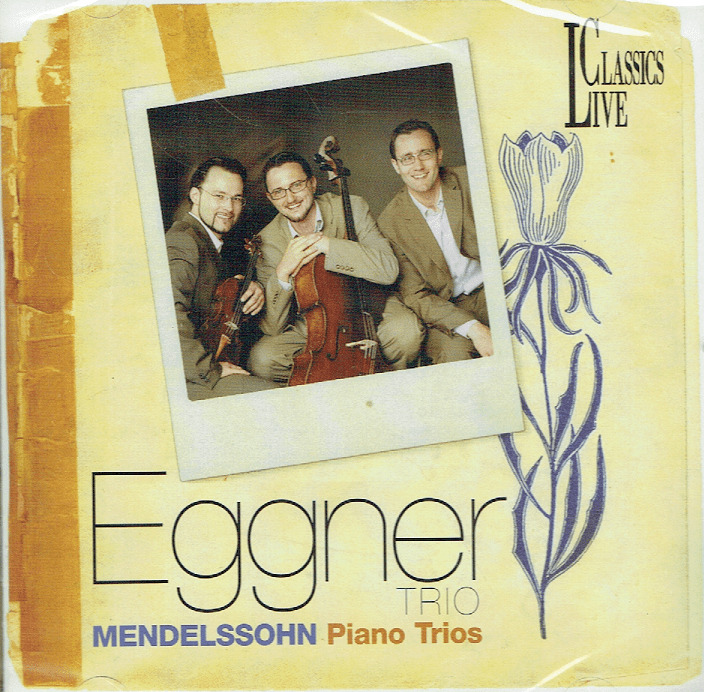 Since the brothers founded the Eggner Trio in 1997, it has appeared throughout Europe, in Japan, Argentina, Uruguay, the USA and quite frequently in Australia and New Zealand. International festivals in which they have performed include the Kissinger Summer, the Schubertiade in Schwarzenberg, the Heidelberg Spring and the Chamber Music Festival in Lockenhaus. The trio received international recognition in 2003 when they won the Melbourne International Chamber Music Competition in Australia. In 2006, through the European Concert Hall Organisation ‘Rising Stars’ series, they played concerts in such venues as Carnegie Hall, Cité de la Musique in Paris, the Festspielhaus Baden-Baden, the Philharmonie in Cologne, the Mozarteum in Salzburg and the Musikverein in Vienna. Recordings with Live Classics include the Beethoven Trio in D Major (‘Ghost’ Trio), the ‘Archduke’ Trio in B-flat Major (for which they were awarded ‘Best Recording 2008’ from Klassiek Centraal), and Mendelssohn’s Trio in d minor, and Trio in c minor. With Gramola they have recorded both piano trios by Shostakovich, the Ivan Eröd Trio op. 21, the CD ‘Kaleidoskop’ with modern works by Austrian composers (Johannes Berauer, Sascha Peres, and Gerrit Wunder), Brahms’ Trio #2 in C Major, and Clara Schumann’s Trio in g minor (for which they were awarded ‘Pasticciopreis’ in Radio Oesterreich 1). The three brothers have also played as soloists in the triple concertos of Ludwig van Beethoven and Bohuslav Martinu, performing with the Orchestra Filharmonica dell‘Umbria (Italy), the Tasmanian Symphony Orchestra (Australia), the South Bohemian Chamber Philharmonic of Budweis (Czech Republic), and the Tonkünstler Orchestra (Austria). Georg Eggner performs on a violin built by Giovanni Pistucci (1895), and Florian Eggner on a cello by Carl Richter (1907). Christoph Eggner, piano, is a multiple winner of competitions and studied with Paul Badura-Skoda and Oleg Maisenberg at the University of Music and Performing Arts, Vienna, as well as Brigitte Engerer and Michel Béroff at the Conservatoire national supérieur de musique et de danse de Paris. He received the Merit Scholarship from the Alban Berg Foundation. Since 2000 he is the assistant for Oleg Maisenberg at the University of Music and Performing Arts, Vienna. Georg Eggner, violin, won first prizes in the national competitions Jugend Musiziert, Prima La Musica (Austria), as well as the international competition Concorso Internationale di Musica per I Giovani, Stresa (Italy), and ‘ORF-violin’ 2001. After eleven years of lessons with Boris Kushnir, he studied with Günter Pichler of the University of Music and Performing Arts Vienna. He received scholarships from the Alban Berg Foundation, the Dürr Foundation and the Tokyo Foundation.